You will explore the longest dry cave in Asia and an underground royal imperial palace in Paradise cave. Visitors will be absolutely conquered by the splendid beauty of this cave. Lots of white stalactites inside the cave make it special, unique compare to the one in Phong Nha cave. All create the beauty with various figures that no place elsewhere on earth can compare. The darkness inside the cave will make the trip more exciting. Visitors will soak in mud bathing and participate in many water activities on the Chay river. The Dark cave will be perfect place for those who want savor and challenge themselves in really cool water and admire the mighty of the forest. Pick you up at hotel in Dong Hoi and directly transfer to Paradise cave. On the way, we follow the legendary Ho Chi Minh trail and know about the rural life of the local people. Arriving at the site, we get transfer by golf cart to the cave entrance and we will start walking up with many steps (519 steps) to reach the cave entrance. The cave was found in 2005 by a local man named Ho Khanh and Paradise cave is a part of Phong Nha Ke Bang National Park covering more than 200.000 ha and was formed millions years ago. And British Caving Association discovered first 5km in 2005. The cave is 31 km long, the longest dry cave in Asia. You will go in and imagine how amazing the cave is and from now you can understand why it got this name “Paradise”. The scenery in the cave comes out like the painting in a fairy tale story. Lots of stalagmites growing up featuring some pictures such as sky – supporting tower, inter flower tower, communal house. The landscape with various colors will come out from everywhere you go and will definitely bear in your mind. Next, we drive you to advneture Dark cave. The cave has its own beauty, it represented geological tectonics around 400 millions years ago. The British Caving Association discovered the cave in 1992. Dark cave features many different stalactites with various colors. On arrival, visitors can experience a 400m zip lining shuttle service across the river to come to the cave entrance. After exploring the cave in the dark then have a mud bathing in the cave. Followed by kayaking to discover the Chay River, then swing the rope and jump down to swim in the Chay river and join in fascinating underwater games. Eventually, we will take you to restaurant for lunch. Following by a car transfer back to your hotel. The tour will finish here. How special is paradise – dark cave tour? The tour is aimed to provide you with an adventurous journey to Paradise cave. By the way, visitors grab their opportunity to explore the longest dry cave in Asia or find out a glorious underground palace at one of the most prettiest caves in the world. 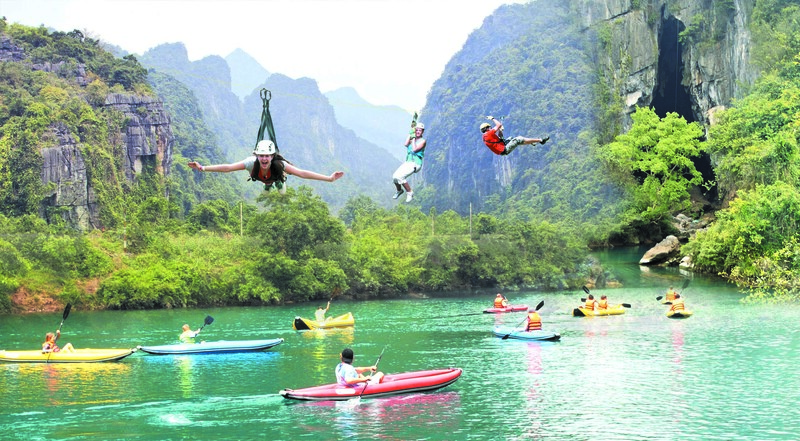 Joining many water sports on the river and experience mud bathing at Dark cave will be a unique trip designed for visitors coming to Phong Nha National Park for the first time.